Nobody in the history of culture has known more about the art of persuasion than the avant-garde painters, sculptors, writers, composers, choreographers, and impresarios who transformed European art from the end of the nineteenth century to the middle of the twentieth century. Generally working with little or no institutional support, these extraordinary individuals built a formidable audience even as they rejected every single one of the audience’s assumptions about the nature of narrative, syntax, sight, sound, and reality itself. Their numbers included that glittering public figure Diaghilev, who glamorized new experiences so as to appeal to the restless rich, and also that austere loner Mondrian, who changed the face of an art form by converting a tiny minority to a revolutionary aesthetic. Some shocked, some charmed, some threatened, some cajoled, some instructed. Some managed to do a number of these things at more or less the same time. Always they insisted that forms, feelings, and attitudes which the public initially found at best alien were in fact inevitable. What still astonishes is the scale of their success. Everybody would like to know how it was done. With support for the arts in decline and the public increasingly convinced that culture can be had for free or close to free on the iPad, we find ourselves wondering exactly how, in 1913, our forebears pulled off events as unforgettable as the first night of Stravinsky’s “Sacre du printemps”in Paris and the Armory Show in New York. We wonder how van Gogh’s paintings, which were impossible to sell at his death in 1890, could have been the subjects of such a great many forgeries little more than a generation later. (The story is related in a new book by Modris Eksteins called Solar Dance: Van Gogh, Forgery, and the Eclipse of Certainty.) We are amazed that Gertrude Stein’s dauntingly peculiar prose could help make her a heroine on an American lecture tour in 1934–1935. And the more closely we examine the age of the avant-garde, the more confounding our discoveries become. Our cultural technocrats, with their surveys, polls, and pie charts, cannot seem to persuade anybody of anything, certainly when compared with the avant-garde generations who transformed the cultural imagination of Europe, America, and much of the rest of the world. And they managed all this even though many of them were eccentric, maladroit, belligerent, restless, conniving, insecure, pedantic, or downright unstable. Although few lives have been more closely studied than those of Vincent van Gogh and Gertrude Stein, there are many reasons to reconsider the avant-garde art of persuasion in the wake of a new round of books and exhibitions that explore these two formidable figures and their extraordinary families. There is some danger, in our reality-show moment, of confusing the art of persuasion, an essential aspect of the genius of the avant-garde, with the art of promotion, of which the avant-gardists were certainly often masters, but as a means rather than an end. Steven Naifeh and Gregory White Smith’s immense new life of van Gogh, a book in which there is much to admire, occasionally risks turning the artist into some kind of tormented and perpetually failing careerist, as he writes worriedly to his brother Theo, the art dealer who staked his reputation on selling the work of the Post-Impressionists. As for Stein, she was in many respects a careerist, and a damn successful one at that, although to reduce her career to self-promotion would be to grievously misconstrue two entirely admirable exhibitions, “Seeing Gertrude Stein: Five Stories,” which originated at the Contemporary Jewish Museum in San Francisco, and “The Steins Collect: Matisse, Picasso, and the Parisian Avant-Garde,” currently at the Metropolitan Museum of Art. We make a mistake when we view ambition, as played out in the very different lives of Vincent van Gogh and Gertrude Stein, as no more than a psychological problem, a more or less successful resolution of drives and ambitions shaped by family history and brain chemistry. By that logic, we are all scrambling for our fifteen minutes of fame, whether in the Steins’ salon on the rue de Fleurus or as Donald Trump’s next apprentice. What the avant-gardists never forgot—and constantly meant to remind their public— was that there are different kinds of fame and therefore different kinds of ambition. The men and the women of the avant-garde would never have succeeded if they had not believed very deeply in the ideas and ideals that they were determined to inculcate in a reluctant public. The publicity was powered by conviction, by faith, by visions of the future. When James Lord first met Gertrude Stein in Paris in 1945, she had about her, as he later wrote, “something of the schoolteacher, a homespun, sibyl-like and autocratic schoolteacher.” Reading van Gogh’s letters, we often find him launching into the most marvelous discourses on the nature of art: he, too, can be a teacher, and a teacher with some of the missionary zeal that had earlier pushed him to embrace the religious life and work among the poor. For the avant-gardist, persuasion was never very far removed from pedagogy. And while we are eager to embrace the noisy, melodramatic, flamboyant aspects of the avant-garde, I think we are less sure what to do with the impulses of the autocratic schoolteacher, which were also integral to the modern revolution in the arts. We risk forgetting how deeply entangled the avant-garde was with the seriousness of the Victorians, and to what extent their striving spirit was an extension of the strenuousness that the Victorians celebrated. Behind even the dandyish nihilism of Duchamp there is a sobriety— and maybe even a sincerity—not entirely unlike that of a Victorian cleric. Peggy Guggenheim, the carefree heiress who slept with whomever she liked, can look like a rather grimly determined missionary for modernism as she hangs one young American artist after another at her Art of This Century gallery in New York in the 1940s. The Victorian roots of avant-garde idealism are one of the subjects of an exhibition—“The Cult of Beauty: The Victorian Avant-Garde 1860–1900”—that opened at the Victoria and Albert in London last spring and is currently at the Legion of Honor in San Francisco. With its stark juxtaposition of what we tend to think of as conservative and radical values, “the Victorian avant-garde” is a phrase calculated to catch our attention, and it certainly does. This exhibition—organized by Stephen Calloway and Lynn Federle Orr—is especially strong in the decorative arts, with works in wood, metal, fabric, and ceramic marshaled to recreate a sensuous, invigorating late-nineteenthcentury environment. For some highly educated Victorians, these rooms, with their dramatic synthesis of influences East and West, ancient and modern, suggested a new kind of freedom. We can see how the cult of beauty, a late Victorian riposte to conventional Victorian morality, pivoted toward the avant-garde’s determination to live in a different way. The work here, by no means unfamiliar, includes wonderfully fantastical furniture, decorations, and tableware by William Morris, Edward William Godwin, Christopher Dresser, and Thomas Jeckyll. With the exception of Whistler, the paintings are rarely more than merely charming, and many are not even that. I was held by Edward Burne-Jones’s Laus Veneris, based on a poem by Swinburne. This densely patterned medieval fairy tale, with its flattening of forms and sharp orchestrations of oranges and blues, suggests a precedent for the chromatic lyricism of infinitely greater works by Vuillard, Bonnard, and Balthus. Among the most interesting sections of the “Cult of Beauty” catalogue is Calloway’s essay “‘The Palace of Art’: Artists, Collectors and their Houses.” Calloway describes a growing fascination with the homes and the studios of artists, and how a distinctive style of decoration—strikingly ascetic in Whistler’s case, lyrically antiquarian in Dante Gabriel Rossetti’s—became the model for a new focus on everyday life as transcendent experience. To turn from paintings and photographs of Whistler’s and Rossetti’s homes to the photographs of the Stein apartment on the rue de Fleurus in Paris, which are a significant component in “Seeing Gertrude Stein” and “The Steins Collect,” is to find Calloway’s Victorian “Palace of Art” re-imagined across the Channel a generation later. Calloway observes that in the 1860s and 1870s “people began to be highly curious not just about works of art, but about artists themselves. As the ideal of Art for Art’s Sake began to gain currency in the 1860s, so increasingly the life devoted to art came to be perceived as a high calling.” Stein was a writer, not a painter, but the studio that she created with her brother, Leo, hung with works by Matisse and Picasso, became famous not only as a place to see paintings, but also as a place where the very arrangement of the furniture and the antiques reflected the values of the avant-garde. In a famous photograph by Man Ray, Stein is seated at her desk writing as Alice B. Toklas comes through a door, the acolyte entering the temple of art where Stein presides. Van Gogh, who was only thirty-seven when he died in 1890, was certainly at odds with the hedonistic cult of beauty that enraptured the Pre-Raphaelites, but he shared many of the concerns of the Victorian avant-garde. His painting of his bedroom in Arles is the boldest imaginable impression of the artist’s private kingdom, the place where he sleeps and dreams, with rustic furniture that might be said to take the principles of the Arts and Crafts Movement to an extreme, and a harmony of blues and yellows that parallels color schemes dear to Whistler, the king of the aesthetes. As for the central struggle of van Gogh’s life, which was to paint the world around him with an intensity not unlike the intensity of religious experience, this is certainly an ambition that would have been familiar to Ruskin and William Morris and the Pre-Raphaelite painters who embodied their ideas. They often aimed for realism and gravitas, but generally fell far short of van Gogh’s hyperbolic naturalism. STEVEN NAIFEH AND Gregory White Smith’s life of van Gogh is massive and meticulously detailed, with the slow-building force of a Victorian triple-decker novel. The approach works for van Gogh, at least to the extent that we are encouraged to regard him not so much as a modern man but as a hero of the century that gave birth to the modern century. Although the nineteenth-century medical records do not make it easy to understand the nature of van Gogh’s depressions and manias, Naifeh and Smith bring us as close as will probably ever be possible to the agonies he was incapable of ever mastering for very long. Anybody who has read Naifeh and Smith’s earlier biography of Jackson Pollock knows they have a particular feeling for charismatic, self-destructive artists, and van Gogh, like Pollock half a century later, could not survive without pulling family and friends into the maelstrom. Family was arguably everything for van Gogh, who spent his life trying to reconcile the rival claims of religion, art, and commerce, represented by his father, who was a pastor, and his various relatives who worked in the art business. Van Gogh himself at one time or another aimed for both careers, at first trying to make his way as an art dealer, then turning to a ministry among the poor before embracing the struggle to become a painter. One might think that a tale told this often could no longer rise above the level of cliché, but the van Gogh story still has the power to shock. In his neediness he could be selfish, uncaring, and downright cruel. His wild behavior became such an embarrassment to his parents that it may well have led his father to his death; his mother certainly thought so. And it is alarming to witness the depth of van Gogh’s dependence on his brother, who struggled his whole adult life to support a sibling who was at best a selfish spendthrift and at times something like a brilliant psychopath. In his late twenties and early thirties van Gogh somehow managed to overlook much of the mayhem, but in his later years he could no longer ignore the hell that his own hell was inflicting on those around him. By the time he arrived in Auvers, not far from Paris, where he spent his last months, even those who admired him and cared about him hesitated to come near—he was such a disquieting, upsetting presence. As for his end, Naifeh and Smith wager that he did not commit suicide, but was instead the victim of a bullet fired by an adolescent boy, one of a group who had found amusement in tormenting the anti-social artist with the horrifyingly misshapen ear. When John Rewald, the great historian of Post-Impressionism, visited Auvers in the 1930s, he heard stories that called into question van Gogh’s suicide. It may be that van Gogh said the wound was self-inflicted in order to protect the adolescent killer, an act of generosity by no means uncharacteristic of this complex, tortured soul. Naifeh and Smith’s huge book, although animated by an altogether admirable feeling for life as moment-to-moment experience, does not finally ring true. The heart of the matter eludes them. Their painstaking accretion of detail—nearly 900 pages—leaves van Gogh mummified. They are undone partly by the profusion of the letters to Theo, which chronicle in sometimes mind-numbing detail Vincent’s wild and inevitably hopeless ambition to market his own paintings or to become self-supporting by means of one or another harebrained scheme. The entrepreneurial side of the avant-garde takes up far too much of the foreground in this biography, and there are many pages that feel more than anything else like a document of our own times. One of the results is that van Gogh’s rapid and sometimes baffling shifts in style can seem less like the zigzags of a questioning spirit than the misfiring calculations of a careerist. Naifeh and Smith cannot really explain how van Gogh’s violent opposition to Impressionism, enunciated during his years in Holland, could have turned so abruptly to an embrace of Impressionism once he arrived in Paris in 1886. They run the risk of leaving the impression that van Gogh was trying to be chic. While they are certainly attentive to van Gogh’s every word, they are so insistently focused on the tenacious pursuit of naturalistic truth that runs through all his work that they lose track of the deeper formal struggles propelling him toward the revelatory work of his last years. IN JANUARY 1890, in the first issue of a new magazine called Mercure de France, the twenty-four-year-old art critic Albert Aurier published a groundbreaking article about van Gogh. He argued that the painter was a kind of Symbolist, whose work was “at once entirely realistic and yet almost supernatural, of an excessive nature where everything—beings and things, shadows and lights, forms and colors—rears and rises up with a raging will to howl its own essential song in the most intense and fiercely high-pitched timbre.” Aurier’s estimate of van Gogh as a Symbolist of the natural world is exactly right, but Naifeh and Smith find this argument incomprehensible, and go so far as to wonder why van Gogh, in writing to Aurier, “left unchallenged the strange, insupportable claim that he was ‘almost always a Symbolist.’” In missing van Gogh’s yearning for a naturalism that transcends nature, Naifeh and Smith have seen only one half of van Gogh’s vision, the part that moved him to write to his friend the painter Emile Bernard that “one has to look for the possible, the logical, the true.” What they have missed is the essential fact that, for van Gogh, the real becomes a symbol for the truest, deepest feelings. Writing to Bernard of some landscapes he was doing in Saint-Rémy, he remarked that “in order to give an impression of anxiety, you can try to do it without heading straight for the historical Garden of Gethsemane.” The artist must find new ways to embrace the oldest yearnings for transcendent experience. Reading van Gogh’s great letter to Bernard in 1889, in the extraordinary six-volume edition of van Gogh’s letters published by Thames and Hudson, is a particularly rich experience, because the works van Gogh mentions—by his own hand, by Bernard, by someone else—are illustrated right next to the text, and in color. Although we have always known that van Gogh’s literary gifts matched his genius as a painter, this opulent edition does an unprecedented job of showcasing the subtlety with which he gave voice to formal values. “To express the love of two lovers,” he expostulated to Theo from Arles in 1888, “through a marriage of two complementary colors, their mixture and their contrasts, the mysterious vibrations of adjacent tones. To express the thought of a forehead through the radiance of a light tone on a dark background.” And there, on the adjacent page, is a portrait of Eugène Boch in which van Gogh does exactly that. This is one of the most beautifully and scrupulously produced books of recent times. The magisterial design, by Wim Crouwel, sets blocks of text and images of varying sizes in a framework of triple-column pages (two broad columns, one narrow) that is treated with wonderful flexibility and imagination. There is a lightness and openness about the design that recalls the finest Swiss and Dutch typography of the twentieth century, with the astringencies of the Bauhaus giving way to a more easygoing temperament. No volumes do more to bring van Gogh’s imagination to life. I wish I could be half as enthusiastic about “Van Gogh: Up Close,” the exhibition that is currently pulling in crowds at the Philadelphia Museum of Art. A team of four curators, with Joseph Rishel and Jennifer Thompson representing Philadelphia, has endeavored to draw together works from all periods of van Gogh’s career around his interest in giving us a magnified impression of nature’s smaller wonders—gatherings of flowers in a garden, ivy covering the ground, the trunk of a tree. That many of the landscapes included are panoramic works including deep vistas as well as striking foregrounds does not seem to perturb the curators. This ambitious show is really not much more than a grandiose miscellany, with a relatively small number of paintings—including Almond Blossom, Giant Peacock Moth, and Ears of Wheat—that can be said to illustrate the theme. And so museumgoers—at least those few who do not have the audio guide clamped on their heads—are left to their own thoughts. What I was left with was the yearning for clarity that fuels nearly everything van Gogh ever did. This is very much a young man’s art—not surprisingly, since he had hardly begun painting in earnest in his late twenties, and was in full command of his powers for only two or three years. There is nothing of the gracious embrace of uncertainty that characterizes the late avowals of Cézanne, Monet, or Bonnard. An enchanting didacticism is what van Gogh arrives at in his final years, when his art is fueled by super-powered colors, insistent outlines, and rhythmic brushwork. As he brings the moth, the almond blossoms, and the ears of wheat into focus, he becomes one of the supreme masters of the avant-garde art of persuasion. He persuades us that nature really does feel the way it feels to him. The paintings have some of the quality of a beautifully illuminated gospel. “SOME CAME TO mock and remained to pray,” remembered Leo Stein of the visitors to the salons that he and his sister and his brother, Michael, and his wife, Sarah, held in their Parisian apartments, beginning in the first decade of the new century and continuing, in the case of Gertrude, until well after her own death in 1946, when visitors were still coming to see the Picassos, then presided over by Alice. Along with the paintings by Matisse and Picasso, their collections at one time or another contained significant works by Degas, Daumier, Manet, Cézanne, Gauguin, Toulouse-Lautrec, Renoir, and Bonnard. Although none of the Steins managed to buy a van Gogh, it was probably not for want of trying. Sarah Stein did receive from Matisse a drawing of his wife walking in an olive grove that the artist surely meant as an homage to van Gogh, with the relatively small figure overwhelmed by the buoyant, rhythmic movements of the foliage in a way that recalls the landscapes van Gogh did at the end of his life in Saint-Rémy and Auvers. That drawing is included in “The Steins Collect,” the exhibition that has now arrived at the Metropolitan Museum of Art after stops in San Francisco and Paris. Like Naifeh and Smith’s book, “The Steins Collect” retells an old story, but the saga of these well-to-do Jewish siblings from Northern California who became the pivotal Parisian collectors of Matisse and Picasso enchants once again. You can regard it as an avant-garde catechism: Leo’s first adventures as a collector; Gertrude’s growing interest in the visual arts; the arrival in Paris of Michael and Sarah; Gertrude sitting for a portrait by Picasso in 1905–’06; Sarah’s great friendship with Matisse, which leads to the founding of Matisse’s short-lived school; Alice B. Toklas’s appearance; the break between Gertrude and Leo and Leo’s eventual rejection of much of modern art; Michael and Sarah commissioning Le Corbusier to build for them one of his great early houses. By comparison with the story of the van Gogh brothers— Theo died less than a year after Vincent, reduced to madness by the ravages of syphilis—the Steins were supremely fortunate. We may wonder if Leo, Michael, and Sarah ever again felt the exhilaration of that first decade in Paris, and in recent years dark questions have been raised as to exactly how Gertrude and Alice managed to survive World War II in France and return to their Parisian apartment and find the paintings intact. But say what you will, there is about Gertrude Stein, dying in Paris in 1946 with her magnificent Picassos all around her, something of the aura of beatification, the prophetess vindicated, the vindication light and comic, much like the treatment of the lives of the saints in Four Saints in Three Acts, the opera she created with Virgil Thomson (which was presented at BAM in Mark Morris’s buoyant production just as “The Steins Collect” opened at the Metropolitan). No one can doubt that the particular character of the Steins’ collections was shaped to a significant degree by financial necessity. Leo had begun by collecting works by somewhat established artists, but on his limited budget his purchases were of necessity minor. 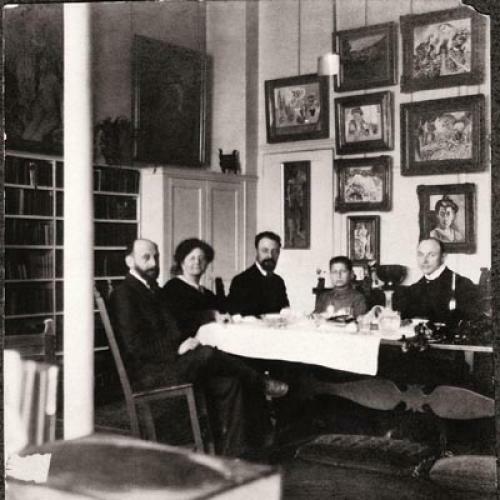 In 1904 he and Gertrude joined their resources to buy a major painting by Cézanne, Madame Cézanne with a Fan, and soon enough they saw that by buying works by the nearly unknown and pretty much unsalable Picasso and Matisse, they were getting a lot more bang for their buck. Rebecca Rabinow of the Metropolitan—who organized the exhibition with Janet Bishop and Cécile Debray—reports in the catalogue that “Leo and Gertrude considered their paintings to be investments, which explains why, during these years, they always pooled their funds.” Someone close to the family is said to have commented of their Daumier that “someday [it would] be worth its weight in gold.” As for their purchases of Picasso and Matisse, the window of opportunity turned out to be narrow; within a few years the Steins had been priced out of the market. And in later years all of them sold many paintings in order to support themselves. In the meantime, they had the social benefit of having the paintings hanging on their walls. The growing fame of their collections turned what would have been just another group of well-off Americans with bohemian inclinations into magnetic figures, the people everybody wanted to know. WHILE THERE ARE surely advantages to a time such as ours, when we view private life as relatively detached from the larger movements of culture and society, Gertrude Stein could probably not have imagined becoming fully herself without in some way reshaping the world around her. “Seeing Gertrude Stein: Five Stories”—the exhibition organized by Wanda M. Corn and Tirza True Latimer that originated in San Francisco and was at the National Portrait Gallery in Washington last fall—is meant to demonstrate how this worked. I approached the show with a certain hesitation, having found the catalogue a little heavy on identity politics. But as presented at the National Portrait Gallery, this gathering of photographs, paintings, drawings, books, manuscripts, radio and film clips, and even some of Stein’s clothing does at least suggest how the avant-garde imagination could blur the lines between private experience and public avowal. The landmarks of the modern imagination that we associate with Gertrude Stein—beginning with Picasso’s 1905–’06 portrait of her and what many regard as Stein’s greatest work of fiction, The Making of Americans—are freestanding artistic creations that double as landmarks of a new consciousness. Stein may not be a writer to be considered in the company of Proust, Joyce, Woolf, and Colette, but she is one of the originals, her voice entirely her own. As for her apartment, her pictures, her brown velvet suits: these were the outward signs of an inward transformation, as essential for Gertrude Stein as the yellow house in Arles and the Provençal straw hat were for van Gogh. For the Steins, as for van Gogh, formalism had to be affective—not a rejection of the world but a new kind of engagement with the world. For Gertrude, it was as natural as the pleasure of looking at oil paint on a flat surface. For Leo, it was too much a matter of living things to have anything to do with the pure forms of the philosophers. As Claudine Grammont points out in an essay in the catalogue for “The Steins Collect,” their thinking owed a good deal to the ideas of Berenson, Fry, and Bell, who “considered the work of art in its formal reality no longer as an object of contemplation, but rather as the framework of an experience.” Wasn’t that what van Gogh was after, too? I HAVE TO confess that the longer I lingered in the galleries of “The Steins Collect,” the more forcibly I was struck by how courageous their taste really was. The most famous story about their activity as collectors involves Leo and Gertrude’s excitement about Matisse’s portrait of his wife, Woman With a Hat, which they discovered at the Salon d’Automne in 1905. It was displayed in a room with other works by the artists who would become known as the Fauves, and both Leo and Gertrude would later recall the fury of the crowd. “A tempest raged at the Autumn Salon,” Leo wrote. “The visitors howled and jeered.” In The Autobiography of Alice B. Toklas, Gertrude observed that Woman With a Hat “infuriated the public, they tried to scratch off the paint.” The Steins, who had not yet met Matisse, decided to buy the painting. Communicating with the artist through the secretary of the Salon, they attempted to negotiate a lower price, but Matisse would not budge. And so they decided to pay the full price for Woman With a Hat, in which Madame Matisse’s eloquent almond-shaped eyes are wrapped in a rich, startling cacophony of complementary colors. As the story is almost invariably told today, we are meant to root for the Steins and to wonder at the folly of the philistines. But who among us cannot in all honesty wonder whether we would have been capable of taking the leap of faith that was required of the Steins before they bought Matisse’s Woman With a Hat, or any of the other furiously experimental canvases produced by Matisse and Picasso in those years? The Steins bought Matisse and Picasso when those artists were only just finding their way, and many of the paintings that they eagerly purchased are arguably not as formally resolved as works the artists did a few years later, when their prices had gone beyond what the Steins could afford. The Steins were so successful in persuading the world of the correctness of their taste that by now we are in danger of losing track of the risks they took on behalf of modern art. Standing in the Salon d’Automne in 1905, Leo and Gertrude Stein demonstrated something like the moral force of Victorian social reformers. They were defending a principle they were themselves just beginning to understand against a public whose mockery only reinforced their conviction about the bankruptcy of the old ideals. Thirty years later, when Stein toured the United States with her lecture on “Pictures,” preaching the pleasure of looking at anything painted in oil paint on a flat surface, her plainspoken cadences may well have been meant to echo the nineteenth-century reformers whom she later saluted in her opera about Susan B. Anthony, The Mother of Us All. And like some of those reformers, the men and women of the avant-garde were so adept at persuading others precisely because they began by persuading themselves. Before everything else, they had had to master their own doubts. Of course Gertrude Stein did not admit to being uncertain about anything. But there was also Vincent van Gogh, whose most simply and eloquently limned lessons in the emotional power of colors and lines had been wrested from the anguished days and nights of a man who could not stop working for fear that if he did he would surely go mad. Looking back to those furious struggles, who can doubt that we no longer take the art of persuasion as seriously as we should? Jed Perl is the art critic for The New Republic. This article appeared in the April 19, 2012 issue of the magazine.